Meet Katie, the Guide behind “Boston to Cambridge: Parks, Brownstones and a Killer Skyline.” She opens up on why to cross bridges, the joys of solo travel, and the best way to explore Boston. 1. What will I encounter on the “Parks, Brownstones and a Killer Skyline” Sidewalk? This Sidewalk is about exploring the core of Boston but seeing it in a different way. It’s a highly traffic’d area, but there are a bunch of smaller details that even locals don’t know about or don’t focus on. 2. What kinds of details do people not see? A lot of people ask me for what is the best view of the Boston skyline. Many visitors just tend to walk along the Boston side of the Esplanade (bank of the Charles River) and that’s where they stop. On my Sidewalk, people are led further along the Esplanade to the Longfellow Bridge. Most people steer clear of the bridge because it is under construction, but the footpath is open and you can walk across it. If you go half way, you get a fantastic view of the Boston skyline. And if you keep going a little further, you can even see the gold dome of the State House below the modern skyscrapers. These are the views that people just don’t know about. 3. Who is the type of person that should go on your Sidewalk? Who is going to love it? Definitely someone who looks around, someone who walks with their head up. This Sidewalk is for people who want to see the details rather than the painted surface. It’s also for people who want a real opportunity to discover rather than just be pointed at something. There is a part of the Sidewalk where I recommend just meandering around one of Boston’s oldest neighborhoods to note the small details: colonial doors, brick sidewalks, antique gas lamps, ornate iron work… someone who is comfortable with exploring a little on their own should go on my Sidewalk. 4. 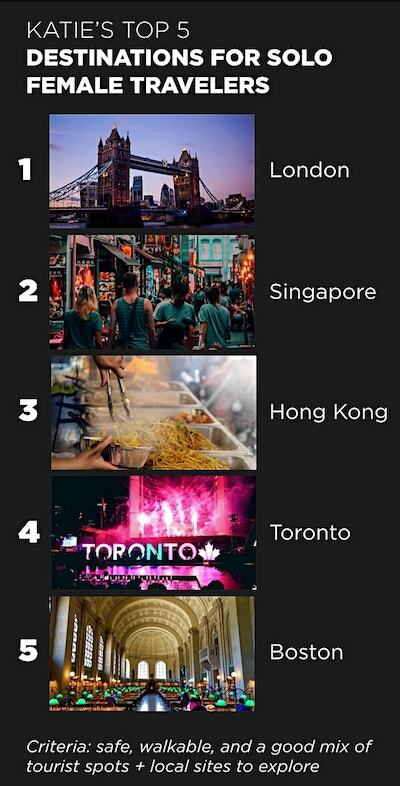 What is the sign of a good travel experience? It depends on the trip. Sometimes my goal is, “I want to see all the sights” and sometimes it’s more like, “I want to chill and do nothing.” But either way, the sign of a good trip is returning home and not wanting to be back. After I come home and have rested up, if I think back on the trip and want to return, that’s how I know I’ve had a good travel experience. 5. It seems like you do a lot of solo travel. How did you get into that? A friend of mine had gone on a solo trip to Japan and I was inspired. I ended up planning a 10 day trip to Japan and traveled to Tokyo, Kyoto, Hiroshima and Fukuoka, and it was amazing. With solo travel, you obviously get to do what you want to do on your own schedule, but there was something that actually surprised me: I noticed that as a solo traveler, I either tended to seek out people more, or people tended to seek me out more [compared to when I had travelled with someone else]. In Japan, I stayed in a small hostel that was very communal. A group of Spaniard guests cooked dinner and invited everyone to join. We all bonded over dinner and someone mentioned wanting to go to a sumo match taking place that evening. Sumo had not crossed my mind in the slightest, but after the fun dinner, I decided to go. It was such a good time. We ended up becoming friends with the Japanese family sitting in front of us and went out for drinks with them after the match. I don’t think I would have done any of that unless I was traveling solo. 7. Over the course of your travels, are there any customs that you have found fascinating? In Korea and some other Asian countries, you quickly notice the way people hand over money when they purchase things. In Korea, the formal way to pay is to use two hands to hand over money. The less formal way is to fold the left arm in front of you and extend the money in the right hand. Both are signs of respect and politeness. Having lived in Korea for a few years after college, I find myself still doing this in Boston. It’s second nature to me now. 8. Any final words of advice to live by? Want to tell the story of your favorite walk in a neighborhood you love (and earn earning a little side cash)? Create a Sidewalk of your own! Questions? Need help getting started? No problem, email Jason (jason@sidewalk.guide) or Corey (corey@sidewalk.guide). 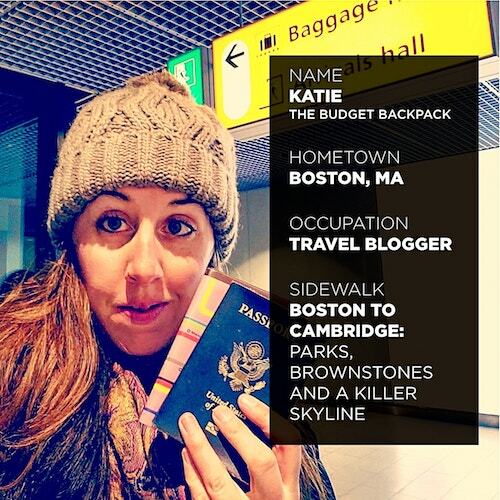 You can follow Katie and her adventures around the world her blog The Budget Backpack and on Instagram. And say hello to us on Instagram, Twitter, and Facebook!